so we can get you back on track! Without teeth, we can’t chew. Imagine that. No more crunchy raw vegetables and fruits! No more nuts! We need healthy teeth and gums to eat nutritious foods. And we need to eat nutritious foods for healthy teeth. 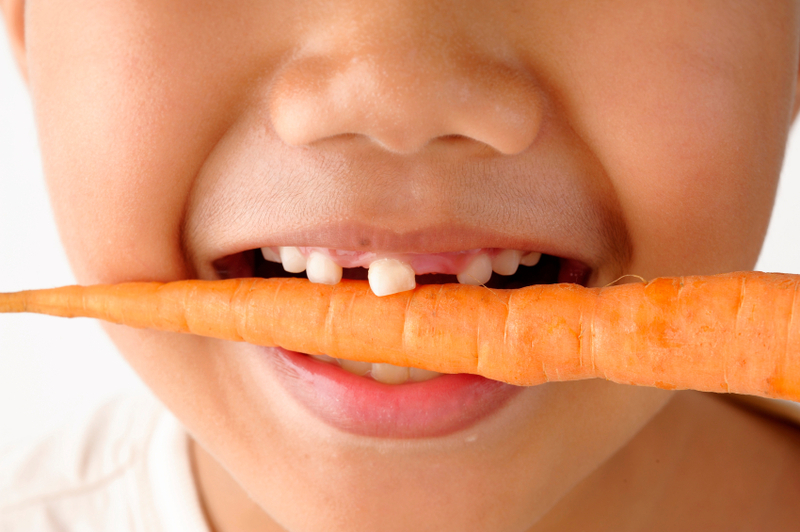 As children, our diet influences how our teeth develop. And once we’re grown, with all teeth in place, what we eat plays a role in maintaining dental health. If we don’t take care of our teeth and gums, we risk tooth decay, gum disease, and even bone loss. Meanwhile, the state of our teeth and gums can often signal systemic problems, including cardiovascular disease, celiac disease, diabetes, sinus infection, rheumatoid arthritis, irritable bowel disease, gastroesophageal reflux, alcoholism, and more. In fact, your dentist can sometimes diagnose these conditions before your doctor! A cavity is a hole in the tooth’s enamel. Up to 90% of school children and the majority of adults have at least one cavity. If you want inspiration to brush and floss, seek out some Google images of severe untreated cavities. Not a pretty sight. Cavities result from the build-up of plaque – a sticky slimy substance composed mostly of bacteria. In breaking down sugar and carbohydrates, bacteria create acids, and these acids can eat away at the teeth. Cavities hurt when they get bigger and touch nerves. An untreated cavity can become a tooth abscess. So if you find a cavity, get treatment fast. About half of American adults over the age of thirty have some form of periodontal, or gum disease. Gingivitis, or inflammation of the gum tissue, is an early stage problem. With proper care, you can reverse it. But if you don’t, eventually the inflammation will lead to “pockets,” or little spaces between the teeth and gums. 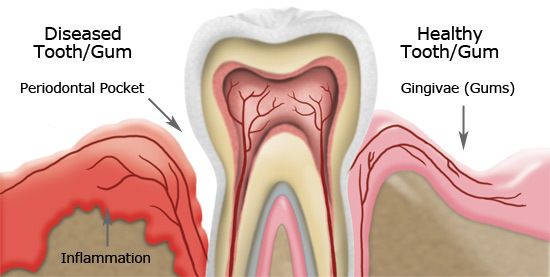 Bacteria love to colonize these pockets, which can lead to periodontitis: the permanent destruction of the tissues that connect teeth to bone in the mouth. Not good. Symptoms of periodontitis include swollen or discolored gums, tender gums, bleeding gums, receding gums, change in tooth sensation when eating, loose teeth, tooth loss, and bad breath. And as if that weren’t bad enough, when gums are inflamed and broken, harmful bacteria can enter the bloodstream more easily, leading to other chronic health problems. – Probiotics: Probiotics may help to decrease gingivitis and plaque; bacteria in fermented foods might suppress the growth of pathogens in the oral cavity. One study showed that consuming fermented dairy was associated with less periodontal diseases. Probiotics from any source could be helpful in a similar way. – Cranberries: Cranberries and other plant foods rich in anthocyanins (such as blueberries, red cabbage, eggplant peel, black rice, and raspberries) may prevent the attachment and colonization of pathogens on host tissues (including teeth). Some studies even show that cranberry extract-infused mouthwash improves dental health! Sure, we all knew about blueberries’ superpowers, but who knew that the humble bog berry could give you healthy teeth? – Echinacea, garlic, ginger, and ginseng: Research shows that these plants help to inhibit growth of periodontal pathogens in test tubes. But human studies are still lacking, so we can’t draw firm conclusions about their benefits. – Whole foods first: Try to get the nutrients mentioned above from whole foods. (Bonus: You give your teeth and gums a workout!) Unless you have a known deficiency, supplements should not be necessary. Keep in mind that if you’re a chronic dieter or you’ve had bariatric surgery, deficiencies are always more likely. Check with your doctor. – Fluoride: The mineral fluoride helps to prevent decalcification in our bodies. In other words, it helps us absorb and use calcium effectively. It also acts topically on teeth to promote their surface health. Fluoride in saliva may help to promote remineralization of enamel. In obesity, excess adipose (fat) tissue often gets deposited in places where it shouldn’t be, such as the liver. Dental health is no exception. Obesity is correlated with adipose tissue being deposited as a lipoma (essentially, a tumour-like mass made of fat) into in the oral cavity, such as inside the lips or cheek, on the tongue, or into the salivary glands. It’s clear that controlling inflammation is important for oral health, and obesity is correlated with inflammation. This is why obesity is the second biggest risk factor for inflammation in the mouth. The only thing that’s worse for your oral health than being overfat is smoking. People who are over-fat are also at greater risk for diabetes, and diabetes, in turn, is associated with poor oral health. This is probably due to elevated blood sugar and its associated effects. 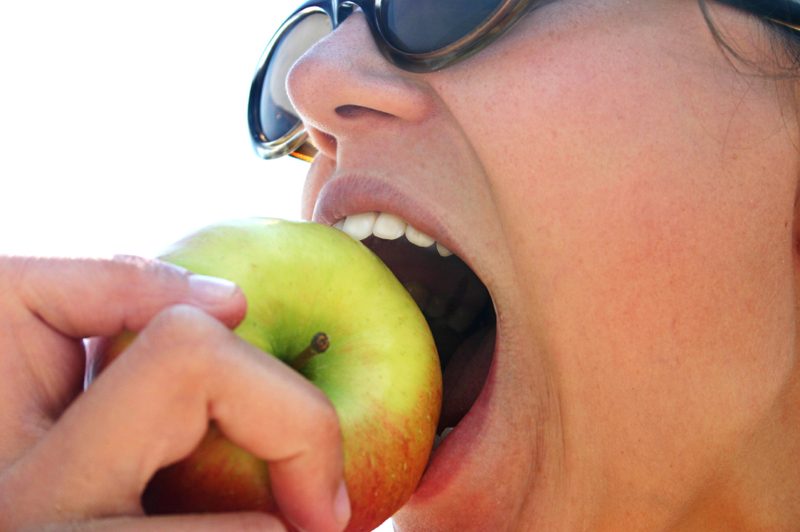 Healthy eating patterns can improve oral health, changing the pH of the mouth’s environment. Meanwhile, the purging and malnutrition associated with disordered eating can seriously compromise oral health. Problems include enamel loss, lesions, dysfunctional salivation, swelling, and sensitivity. Our risk of periodontal disease goes up as we age. But the longer we maintain good oral health, the better our quality of life will be. It’s not clear what exactly causes oral disease with age. Theories include wear and tear on teeth/gums, medication use, financial changes (leading to less preventive treatment), other chronic diseases associated with oral health, and/or immunological changes. What is clear is that taking good care of our teeth and gums at every age is important. Are you surprised? Here’s a probable explanation: It turns out that the sheer amount of sugar we eat may be less harmful to dental health than the frequency of consumption. That’s why sugared sodas and energy drinks are so dangerous. Sipping sugar-containing beverages provides repeated hits of sugar on the teeth. Most sugary beverages are highly acidic, which promotes demineralization. Our mouth gets a double-whammy. Whether frequency or amount of sugar intake is key, one thing is for sure: A diet built around refined and processed carbohydrate foods can lead to tooth decay and gingival inflammation. Artificial sweeteners like sucralose (Splenda) and aspartame (Equal) don’t seem to promote periodontal disease or cavities. Sugar alcohols, such as xylitol or erythritol, don’t seem to influence oral health. Actually, chewing gum containing the sugar alcohol xylitol after meals may even decrease your risk of forming cavities. As for stevia, it doesn’t appear to have negative effects on oral health. But more research is needed here.